What’s on the menu? Turkey, stuffing, gravy, potatoes? Or a side dish of food borne illness? When preparing your family’s Thanksgiving feast this year, make sure to avoid possible food contamination issues, which could lead to serious food borne illnesses. One of the most overlooked occurrences of food contamination occurs within the turkey itself. Alton Brown, host of Food Network’s Good Eats and Iron Chef America, has this to say about stuffing. Be sure to cook your stuffing this Thanksgiving outside of your turkey. You may have heard that cooking the stuffing inside the turkey may create a risk of food poisoning. Because you take the temperature of your turkey in the thigh, the inside of the bird is still not at the USDA suggested 165 degrees. The stuffing has been sitting in an uncooked (or cooking) turkey, exposed to whatever food borne illnesses the turkey may contain. While cooking a turkey to 165 degrees will kill most safety hazards, the stuffing still hasn’t reached that optimal temperature. This allows food borne illnesses to grow rapidly within the turkey, which otherwise would have been killed in the turkey itself. Stuffing cooked outside the bird (technically called “dressing”) can still be just as delicious, if prepared with turkey or chicken stock. 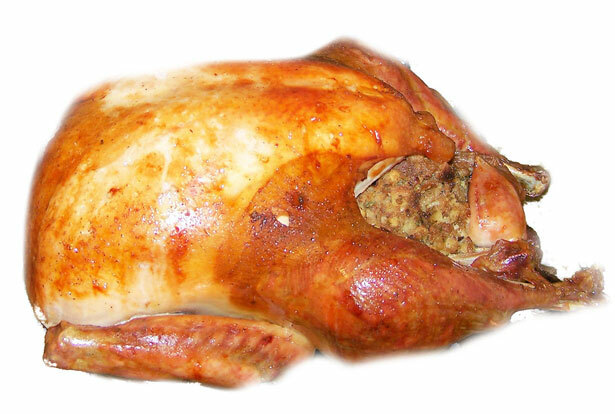 If you were to attempt to cook the stuffing inside the bird, it would require much more time to reach 165 degrees than the turkey, leading to an extremely dry turkey. You can still prepare the stuffing separately, and stuff the turkey once both are finished cooking, if your family prefers this presentation. The USDA’s turkey safety website is here.